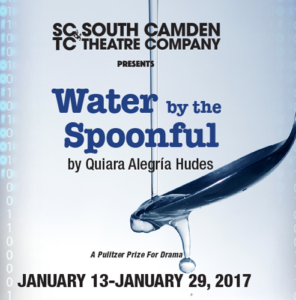 The South Camden Theatre Company will be holding Auditions for Quiara Alegria Hudes’ Pulitzer Prize award winning play “Water by the Spoonful”, directed by Ray Croce. The production will run from January 13th through January 29th. A stipend will be paid. Auditions will be on Sunday, September 25th and Monday, September 26th from 7:00 to 10:00 PM with call backs on Wednesday, September 28th also from 7:00 to 10:00 PM. Auditions are by appointment only; non-equity only. For an appointment please email our production manager Ashley Reiter with your resume and a recent head shot. Auditioners should prepare a two minute contemporary monologue; sides will be used during call backs. The theater is easily reached from all Philadelphia bridges as well as the surrounding South Jersey area. There is ample safe on-street parking with monitoring.